After completing the pick-up truck this student decided to try his hand at using a coping saw. 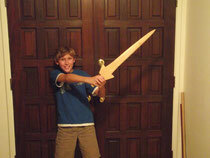 As you can see from the finished product "the sword" was a complete success! With lots of craftsmanship the student used a coping saw to cut the initial shape out of a piece of wood. Then with the assistance of a shinto rasp he was able to refine his project by sculpting the wood into the final shape. Finally with the use of his sanding block and plenty of effort his project was finished.